My desk chair is apparently now Arthur’s favourite bed, which is unfortunate when I actually want to sit down and get on with some work. This is what Arthur thinks of my removing him from my chair. And the second picture is a selection of objects on the windowsill in front of me, including Arthur, again, who is making a point of lying on a hard wooden tray instead of the nice soft blanket on the other side. 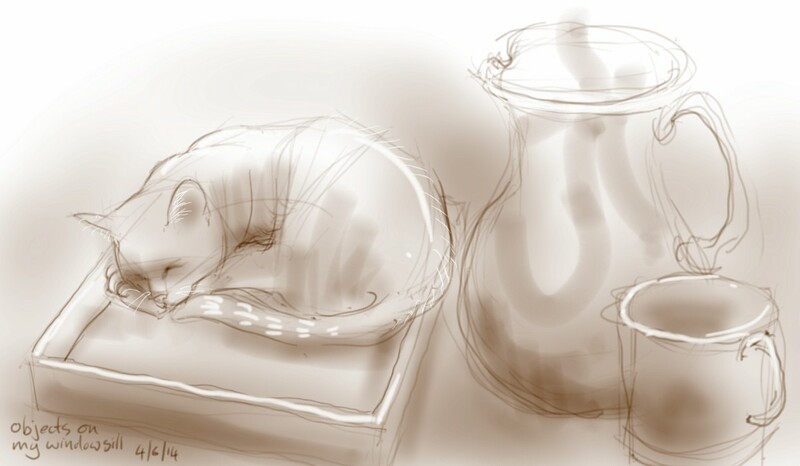 This entry was posted in Cats and tagged art, arthur cat, cat drawing, cat sleeping, cat-of-the-day, digital sketch, drawing, illustration, life drawing, sketch on June 4, 2014 by Nancy Farmer. Arthur knows what he wants and shows his emotions, no need to hide them, right? Really nice sketches! K.
What I do is…put a cushion on the chair – then, when you want to sit down remove the cushion and the cat who may not even notice!